SP Telecom has launched Singapore’s first software-defined wide area network (SD-WAN). It’s based on VMware NSX SD-WAN by VeloCloud which VMware acquired last year. This will provide businesses with a low latency wide-area network that is automated and infrastructure-independent, to deliver robust and more secure networking services. Coupled with SP Telecom’s network management and consultancy services, this collaboration will expand SP Telecom offerings to meet growing customer demand to more securely run, manage, and connect any application from cloud to device. The new SD-WAN services will provide businesses with the ability to automate and prioritize business-critical traffic to travel over faster, more secure connections, as well as set backup options for downed traffic links. This optimization of high traffic volume that enables near real-time access to rapidly changing data, is a key benefit crucial for mission-critical industries such as telecommunications, financial services, and the media and entertainment verticals. accelerate new site deployments through zero-touch automated deployment. SP Telecom’s data network is truly diverse, with network paths running along the Singapore power grid, enabling network resiliency for business-critical functions. Furthermore, this data network is enhanced with superior latency performance for more efficient processes. This reduces the risk of outage that could occur due to power or active equipment failure. Part of its network consultancy services, SP Telecom analyses and optimizes the network to deliver cost savings and efficiency. The connectivity and consultancy services, bundled with the new SD-WAN offering, will enable businesses to innovate fast and more securely by delivering robust performance for cloud applications, all through zero-touch deployment, the automation of network infrastructure implementation. Velocloud says their SD-WAN reduces the branch office footprint with a single click with seamless insertion and chaining of virtualized services on premise and in the cloud. NSX SD-WAN is touted by Velocloud as the industry-leading SD-WAN solution. One that enables customers to deliver better cloud and application performance with full visibility, metrics, control, and automation of all devices and user endpoints, and lower overall costs. VMware NSX SD-WAN provides an extensible platform for enterprises and telcos to integrate both on-premise and cloud services under the same consistent business policy framework. It’s said to eliminate data center backhaul penalties with a cloud-ready network to provide an optimized direct path to public and private enterprise clouds. “We are shifting from a model of data centers to centers of data at the network’s edge. This new networking approach, virtual cloud networking, is required to manage the hyper-distribution of applications and data,” said Sanjay K. Deshmukh, vice president and managing director, Southeast Asia and Korea, VMware. “By deploying VMware SD-WAN by VeloCloud as part of a Virtual Cloud Network, SP Telecom can provide enterprise customers with consistent, pervasive connectivity and intrinsic security for applications, data, and users from the data centers to the cloud and the branch. VMware SD-WAN will enable their customers to streamline the digital transformation journey by providing superior application performance with significantly reduced network complexity,” he added. The managed SD-WAN services market is expected to generate more than $282 million in revenue in the U.S. by the close of 2018, according to researcher Vertical Systems Group. The figure is based on billable U.S. customer sites and WAN access connections installed and under management. Rick Malone, principal of Vertical Systems Group, said he expects a major boost in revenue next year with network operators fully ramped up to sell, deliver and support managed SD-WAN services. A managed SD-WAN service is defined as a carrier-grade network offering for enterprise and business customers, which is managed by a network operator, and delivered over a software-defined network (SDN) service architecture that has separate control (overlay) and data (underlay) planes, according to MEF. Service providers currently selling managed SD-WAN services in the U.S. include: Aryaka, AT&T, CenturyLink, Cogent, Comcast, Fusion Connect, GTT, Hughes, Masergy, MetTel, Sprint, Verizon, Windstream and Zayo by Vertical’s count. Other network operators both domestic and foreign are expected to enter the U.S. market, which will grow the segment’s size, Vertical said. While the managed SD-WAN services market in the U.S. is small, it began to pick up steam in the last half of 2018, said Malone. 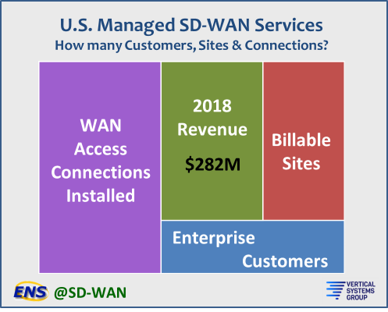 “Carrier-grade managed SD-WAN services in the U.S. began to generate notable revenue in the second half of 2018,” he said. “In 2019, we’ll continue to see SD-WAN as a key enabler for enterprise customers’ digital transformations. The integration between MPLS and internet, combined with the move to cloud, requires a different network and security design – particularly on a global scale. With SD-WAN, enterprises can address these requirements and introduce automation to make networks even more efficient. Future-proof solutions with simple interfaces, like Flexible SD-WAN from Orange, enable enterprises to use their networks dynamically to anticipate and respond to changes in their business environments while migrating applications to the cloud.” Rob Willcock, senior vice president, Americas, Orange Business Services. In 2018, Cisco integrated its Viptela SD-WAN, which is bought in 2017 for $610 billion, more deeply across its enterprise routing platform. Also this year, VMware integrated VeloCloud’s SD-WAN technologies—which it bought last year for an undisclosed sum, into its product lines. Both acquisitions have turned out to be solid moves. Oracle is looking to duplicate Cisco and VMware’s successes next year after buying buying Talari Networks , also for an undisclosed sum, this year. While some of the current SD-WAN vendors will fall by the wayside next year, others will be bought by companies that serve the enterprise and business sectors. Oracle, Cisco and VMWare?Dell bought such SD WAN start ups in 2018. Another trend that will likely continue into 2019 is more firewall vendors entering the SD-WAN market. In 2018, Fortinet and WatchGuard Technologies moved from supplying security to SD-WAN vendors to offering their own flavors of it. There will likely be more partnerships between SD WAN vendors and cloud providers, similar to the deal that Versa Networks did with Amazon Web Services (AWS) to offer SD-WAN to AWS partners. Citrix and Riverbed also announced availability of their SD-WAN offerings on Microsoft Azure cloud and AWS in 2018. Vertical Systems has launched a new research service covering the carrier-based managed SD-WAN services market, focusing on service migration, network connectivity and market sizing. The research content it offers at this time spans managed SD-WAN purchase drivers, customers, WAN access connections, site configuration profiles, pricing and revenue. According to Vertical, managed SD-WAN services are a carrier-grade network offering for enterprise and business customers, managed by a network operator, and delivered over a software defined network service architecture that has separate control and data planes. Not included in this analysis are do-it-yourself SD-WAN solutions purchased directly from an SD-WAN technology supplier or a systems integrator. STATFlash: Managed SD-WAN Services Market Tops $282 Million in the U.S. In the ever arcane world of proprietary/non standardized SD-WANs, Oracle announced that it’s acquiring SD-WAN technology provider Talari Networks for an undisclosed sum. The transaction is expected to close before the end of this year. Talari’s SD-WAN technology is expected to complement Oracle Communications’ Session Border Controller (SBC) and network management infrastructure. Talari’s Failsafe technology is said to enhance the benefits of SD-WAN by adding greater reliability and predictability while maintaining security for site-to-site and site-to-cloud connectivity and application access over any IP network. San Jose, California-based Talari currently serves more than 500 enterprise customers in 40 different countries across a variety of industries, including public sector, financial services, insurance, retail and manufacturing—and it expects to do even bigger things under the Oracle tent. Analysts were not particularly surprised by the deal given the competition now underway in the SD-WAN space. Talari ranked No. 9 in IHS Markit’s rankings of SD-WAN vendors based on second-quarter revenues. There’s not a lot of synergy between Session Border Controllers and SD-WAN, but Lee Doyle, principal analyst at Doyle Research, told FierceTelecom that he can understand why Oracle would want to acquire a product it can monetize in a hot space like this. It also has a history of buying communications companies, Acme Packet and Tekelec, both ongoing businesses. The Talari deal is one in a series of acquisitions Oracle has announced in recent weeks. Last month, the company announced plans to acquire data management and AI solutions provider DataFox. It also announced plans to acquire goBalto, a cloud platform developer in the life science industry. Both Cisco and VMware have been working to blend more SD-WAN technology across their broader portfolios. Last year, VMware bought VeloCloud for an undisclosed sum while Cisco paid $610 million for Viptela. SD-WAN vendors, connectivity providers, and application providers have begun to realize how much they need each other. Total SD-WAN revenue, which includes appliance and control management software, reached $221 million in the most recent second quarter, which was up 25% quarter-over-quarter and twice the amount recorded in the second quarter of last year, according to IHS-Markit. Citrix is an example of an SD-WAN vendor that has relationships with connectivity providers. For example, in May, Citrix partnered with the managed cloud provider RapidScale, which is offering Citrix NetScaler SD-WAN as a standalone managed service over RapidScale’s backbone. And Citrix recently partnered with Teridion to combine SD-WAN with a routing optimization network. Gartner apparently values SD-WAN vendors with a connectivity play because it placed Aryaka and Citrix in the “Challengers” quadrant of its Magic Quadrant for WAN Edge Infrastructure. Recently, Gartner published its first Magic Quadrant for WAN Edge Infrastructure and placed Talari in its “Niche Players” quadrant. The report, which profiles 20 vendors, placed VMware in the top position for completeness of vision, followed by Cisco and SilverPeak in its coveted “Leaders” quadrant. In a survey of 200 senior IT and networking managers in the US and the UK, Sapio Research found 20% of respondents said they have a software-defined WAN project in progress, while 32% haven’t explored the technology and 27% may look at it in the future. About one-third of respondents said they wanted to reduce network costs and to better manage their network infrastructure. The research study found that 48% of those are running SD-WAN proof of concept at select sites or other limited deployments. That means only about 10% are transitioning fully to SD-WAN. The survey was commissioned by Teneo and based on input from 200 senior IT and networking managers evenly split between the U.S. and U.K. The companies have worldwide operations and revenues between $127 million and $38 billion. The survey found that 32% have not yet explored the technology, though 27% may do so in the future. When senior IT professionals were asked why they were considering SD-WAN, the most common reason was the increasing complexity of network infrastructure and performance tasks (cited by 36% of interviewees), closely followed by the need to cut network costs (34%) and the need for better management of network infrastructures (also 34%). Increasing pressure on both company resources and budgets as IT team look after more complex network infrastructures is driving companies to examine SD-WAN’s potential. Exactly half of companies questioned say that deploying and managing networking infrastructure is time-consuming. Interviewees estimate that these upkeep tasks take up 36% of their overall IT budget. One third of the survey (33%) admit that they had used ‘as a Service’ models from external providers to keep on top of maintenance tasks. Researchers also found that companies are blending connectivity options to get necessary bandwidth: nearly four in ten (38%) of interviewees want to add more MPLS, 22% want more Internet connectivity, and 20% want to add more Internet and MPLS combined. Under one in five (17%) said their needs were satisfied. The SD-WANs enterprises deploy will look different from one another, according to the survey. Thirty-eight percent of respondents want to add MPLS, 22% want to add broadband and 20% want to add both. Seventeen percent are happy with their current connectivity. Evens did point to cost savings of using broadband where it makes sense. “We have seen SD-WAN being used to enable businesses to utilize all of the MPLS bandwidth they are paying for to improve service for critical applications and then augment this bandwidth with the cheaper options for less important traffic, thus removing the expensive backup circuits and gaining more bandwidth for less cost,” wrote Evans. Another element that is not yet clear is who companies prefer to work with. Thirty-nine percent of survey respondents want to partner with a global network vendor, 24% with a telecommunication partner and 24% with a management consultancy. The survey found that 8% of respondents are considering specialist SD-WAN vendors, 3% are considering specialist integrators of SD-WAN and 3% will use multiple partners. “Network managers are looking at SD-WAN strategies to run multiple networking environments in standardised ways – whether the underlying motivation is greater simplicity, cost efficiency or transforming critical applications’ performance across their company’s operations,” said Marc Sollars, CTO of Teneo. Meanwhile, the MEF has definesd an SD-WAN service and its various attributes. With strong support from service provider and technology provider members, MEF currently is on track to ratify and publicly release its MEF 3.0 SD-WAN Service Attributes and Service Definition standard in 1Q 2019. SD-WAN service standardization will enable a wide range of ecosystem stakeholders to use the same terminology when buying, selling, assessing, deploying, and delivering SD-WAN services. The SD-WAN service definition is a foundational step for accelerating sales, market adoption, and certification of MEF 3.0 SD-WAN services orchestrated across a global ecosystem of automated networks. SD-WAN service standardization is being conducted within the context of the MEF 3.0 Global Services Framework. It is part of a transformational initiative to standardize a complete family of dynamic Carrier Ethernet (CE), IP, Optical Transport, SD-WAN, security, and other virtualized services that will be orchestrated over programmable networks using LSO (Lifecycle Service Orchestration) APIs. MEF’s SD-WAN service definition specification describes requirements for an application-aware, over-the-top WAN connectivity service that uses policies to determine how application flows are forwarded over multiple underlay networks irrespective of the underlying technologies. Reducing market confusion about service components, core capabilities, and related concepts, thus saving valuable time given the scarce availability of skilled personnel. Enabling service providers and technology providers to focus on providing a core set of common capabilities and then building on that core resulting in differentiated offerings. Facilitating inclusion of SD-WAN services in standardized LSO architectures, thereby advancing efforts to orchestrate MEF 3.0 SD-WAN services across multiple providers. Paving the way for creation and implementation of SD-WAN services certification, which will give users confidence that a service meets a fundamental set of requirements. MEF member companies are involved in multiple SD-WAN implementation-related initiatives that can be leveraged to provide feedback on standardization requirements and create software-oriented artifacts that can be used to accelerate efforts to orchestrate standardized SD-WAN services. These initiatives include the MEF 3.0 Multi-Vendor SD-WAN Implementation project, the MEF18 LSO Hackathon, and several SD-WAN Proof of Concept (PoC) demonstrations at MEF18. The MEF18 LSO Hackathon is focused on developing and validating data models for SD-WAN services. This presents a unique opportunity for those involved in technical aspects of SD-WAN services and products to learn in a hands-on way about the latest SD-WAN service and LSO standardization work at MEF as well as the related API and YANG work at ONF and IETF. Instantiation and Delivery of SD-WAN over a Virtualized and Orchestrated Wholesale Carrier Ethernet Access Service. MEF currently plans to introduce a pilot version of certification for MEF 3.0 SD-WAN services in the first half of 2019. This certification will test a set of service attributes and their behaviors defined in the upcoming SD-WAN standard and described in detail in the MEF 3.0 SD-WAN Service Certification Blueprint. SD-WAN (appliance + control and management software) revenue reached $221M in 2Q18, up 25% QoQ and 2x over 2Q17. VMware led the SD-WAN market with 18% share of 2Q18 revenue, Aryaka was in second place with 15% revenue share, and Cisco enters the top 3 with 12%, according to the DC Network Equipment market tracker early edition from IHS Markit. “With SD-WAN deals becoming more competitive within the North American market, the race to expand into other regions is now well underway. VNF certifications with EMEA and Asia Pacific based service providers are now in full swing where SD-WAN vendors are in the final stages of VNF certifications with BT, Telefonica, Vodafone and China Mobile” said Cliff Grossner, senior research director and advisor for cloud and data center at IHS Markit, a world leader in critical information, analytics and solutions. “Countries top of the agenda for hiring and office expansions for SD-WAN vendors are the United Kingdom, Germany, Singapore, Japan and China where SD-WAN vendors indicate there is heavy SaaS and IaaS traffic between multiple on- and off-premises DCs.” said Grossner. · F5 garnered 47% ADC market share in 2Q18 with revenue up 0.4% QoQ. Citrix had the #2 spot with 28% of revenue, and A10 (8%) rounded out the top 3 market share spots. The IHS Markit Data Center Network Equipment market tracker is part of the Data Center Networks Intelligence Service and provides quarterly worldwide and regional market size, vendor market share, forecasts through 2021, analysis and trends for (1) data center Ethernet switches by category [purpose built, bare metal, blade and general purpose], port speed [1/10/25/40/50/100/200/400GE] and market segment [enterprise, telco and cloud service provider], (2) application delivery controllers by category [hardware-based appliance, virtual appliance], and (3) software-defined WAN (SD-WAN) [appliances and control and management software]. Vendors tracked include A10, ALE, Arista, Array Networks, Aryaka, Barracuda, Cisco, Citrix, CloudGenix, CradlePoint, Dell, F5, FatPipe, HPE, Huawei, Hughes, InfoVista, Juniper, KEMP, Nokia (Nuage), Radware, Riverbed, Silver Peak, Talari, TELoIP, VMware, ZTE and others. The global software defined wide area network (SD-WAN market) was valued at $676.9 million in 2017 and is forecast to witness a CAGR of 54.1% during 2018-2023 and will reach $9,691.0 million by 2023. The demand for cost effective WAN management solutions, increasing adoption of cloud technologies, need for simplified network architecture, end-to-end network security and visibility are driving the market globally. The SD-WAN market is classified into solution and service. The solution category held a larger revenue share in the market accounting for nearly 78% in 2017. During the forecast period, the market for SD-WAN service is expected to witness higher growth, as the need for traffic management to optimize bandwidth and cost reduction by replacement of dedicated WAN network with broadband network without compromising on security, increases. Based on appliances, the SD-WAN market is categorized into virtual, physical and hybrid appliances. Virtual appliance accounted for largest revenue share in the market in 2017. During the forecast period, it will continue to contribute largest revenue share owing to the fact that it reduces the cost incurred in installation and offers configuration and maintenance of complex stack of software virtually. The Asia-Pacific (APAC) SD-WAN market is expected to witness a CAGR of 57.9% during the forecast period. Since the internet speed and internet quality have significantly improved in the region, IT departments are looking for cost effective, secure, performance related solutions to reduce their dependency on multi-protocol label switching (MPLS). Organizations in the IT and telecom industry in the region are focusing on agile, secure, and end-to-end visible WAN management solution, which will support the market growth in future. Some of the key players operating in the market are Cisco Systems, Inc, Citrix Systems, Inc, Silver Peak Systems Inc, CloudGenix Inc, Ecessa Corporation, Viptela Inc, Riverbed Technology, Inc, Mushroom Networks, Inc, VeloCloud networks Inc, Glue Networks Inc, Elfiq Inc.
P & S Intelligence, a brand of P & S Market Research, is a provider of market research and consulting services catering to the market information needs of burgeoning industries across the world. Providing the plinth of market intelligence, P & S as an enterprising research and consulting company, believes in providing thorough landscape analyses on the ever-changing market scenario, to empower companies to make informed decisions and base their business strategies with astuteness. SD-WAN (appliance + control and management software) revenue reached $162M in 1Q18, up 12% QoQ and 2.3x over 1Q2017. VMware (after its VeloCloud acquisition) led the SD-WAN market with 19% share of 1Q2018 revenue, Aryaka was in second place with 18% revenue share, and Silver Peak rounded out the top 3 with 12%, according to the DC Network Equipment market tracker early edition from IHS Markit. “SD-WAN is currently a maturing market, expected to reach $861M worldwide in 2018, as early adopters of SD-WAN are expanding existing deployments, having proved the SD-WAN business case. Adoption of SD-WAN is now ramping even in compliance-sensitive verticals such as healthcare and financial (the payment card industry),” said Cliff Grossner Ph.D., senior research director and advisor for cloud and data center at IHS Markit. “Many SD-WAN vendors have begun to incorporate analytics, utilizing rich telemetry data, into SD-WAN management platforms–enabling enterprises to monitor application traffic flow between multi-cloud environments,” said Grossner. · F5 garnered 46% ADC market share in 1Q18 with revenue up 4% QoQ. Citrix had the #2 spot with 29% of revenue, and A10 (9%) rounded out the top 3 market share spots. The Metro Ethernet Forum is working on a common definition for SSD-WANs and is building out multivendor SD-WAN use cases. MEF is creating a SD-WAN service specification that will outline the required SD WAN components, such as application-centric quality of service and priority policy requirements. MEF’s Multi-Vendor SD-WAN Implementation project is one of the real-world results of the MEF 3.0 framework that was announced at MEF 17 in November. MEF 3.0 is a transformation framework for defining, delivering and certifying agile, assured and orchestrated network services across a global ecosystem of automated networks. While SD-WAN has earned buzzword status across the telecoms industry, a lot of different offerings are available in the marketplace from a host of vendors. Currently, there are no clear definitions of what an SD-WAN service is. MEF members are collaborating to develop an SD-WAN service specification that defines the service components, their attributes, and application-centric QoS, security, and business priority policy requirements to create SD-WAN services. This initiative is led by Riverbed and VeloCloud, now part of VMware, with major contributions from Fujitsu. MEF is using the same blueprint that it successfully deployed when it defined Carrier Ethernet services 10 years ago—which led to the creation of an estimated $80 billion global market for Carrier Ethernet—to create the SD-WAN service definition specification. “The significance of this work is that if you look at what MEF has done for the initial carrier Ethernet definition before that came out there were many, many different implantations,” said Ralph Santitoro, head of SDN/NFV/SD-WAN solutions for Fujitsu. “You weren’t really sure what you were buying. The SD-WAN service market today is in exactly that same kind of state where you can go to different service providers and get an SD-WAN service but it’s apples to oranges to peaches and whatever, but it’s all different because there is no industry standard. MEF hopes to have the specification finished ahead of its MEF 18 conference in October. When the specification is finished, MEF said it would pave the way for MEF 3.0 work on its Lifecycle Service Orchestration (LSO), MEF information models, policy-driven orchestration, intent, and other major projects that could be applied to SD-WAN services. All of those SD-WAN elements would then be integrated into the MEF 3.0 ecosystem to help service providers increase their automation efforts. MEF’s Implementation Project features managed SD-WAN use cases that were driven by MEF’s membership that includes service providers. Because of mergers and acquisitions, service providers are faced with an increasing number of interoperability challenges where they need to support more than one SD-WAN solution. LONDON (April 25, 2018) – IHS Markit (Nasdaq: INFO), a world leader in critical information, analytics and solutions, today released findings from its WAN Strategies North American enterprise survey, which reviews the evolving requirements for wide-area networks (WANs) of medium-to-large companies, including the adoption of software-defined WAN (SD-WAN). Nearly three-quarters (74 percent) of respondents conducted SD-WAN lab trials in 2017; by 2018, many will move into production trials and then to live production. The latest annual survey of network managers from IHS Markit shows that investments in WANs continue unabated, driven by traffic growth, company expansion, adoption of the Internet of things (IoT), the need for greater control over the WAN, and the need to put WAN costs on a sustainable path. Security in particular is the number one network change by a wide margin, and the top reason to invest in new infrastructure, as companies must fend off the constant threat of cyber attacks. Respondents expect their WAN bandwidth usage to grow over 20 percent annually — data center usage is the highest, while branch offices are experiencing the highest growth, at nearly 30 percent per year. Reflecting the significant demands placed on WANs, total WAN expenditures rose nearly 20 percent annually, to reach $300,000 per respondent in 2017. 71 percent of respondents will use off-premises cloud service providers by 2018, which will become the top application strategy in 2018. Worldwide Ethernet access device (EAD) revenue totaled $987 million in 2017, increasing 8 percent over 2016. The market is forecast to reach $1.47 billion in 2021, achieving a 2017–2022 compound annual growth rate (CAGR) of 8 percent. “The EAD market is growing as a direct reflection of the continuous, steady demand from operators for mobile backhaul and wholesale services — and from business, broadband and building applications,” said Richard Webb, associate director, mobile backhaul and small cells research at IHS Markit. 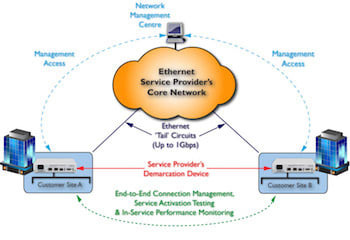 The biannual EAD report from IHS Markit tracks fiber and copper (EFM bonded and EoTDM bonded) Ethernet access devices by port speed, form factor and application. It also tracks uCPE. The report provides worldwide and regional market size, vendor market share, forecasts through 2022, analysis and trends. Image courtesy of Metrodata in the U.K.
SD-WAN (appliance + control and management software) revenue reached $147M in 4Q17, with CY17 up 3.9x over CY16. VeloCloud (acquired by VMware) led the SD-WAN market with 19% share of 4Q17 revenue, Aryaka was in second place with 17% revenue share, and Silver Peak rounded out the top 3 with 12%, according to the DC Network Equipment market tracker early edition from IHS Markit. “Reviewing recent wins, we can see a market that is maturing with a transition from early market adopters to mainstream buyers. Other signs of maturation include expansions at existing clients and incremental product offerings such as security and WAN optimization on top of basic WAN transport virtualization,” said Cliff Grossner, Ph.D., Senior Research Director and Advisor for the Cloud and Data Center Research Practice at IHS Markit. “One noteworthy element—we must not lose sight that SD-WAN is equally important for voice and data even though data gets much of the attention in discussions. We can also expect a next wave of features focused on analytics, making use of the rich telemetry data available with SD-WAN,” said Cliff Grossner. · F5 garnered 42% ADC market share in 4Q17 with revenue down 4% YoY. Citrix had the #2 spot with 30% of revenue, and A10 (9%) rounded out the top 3 market share spots. The IHS Markit Data Center Networks Intelligence Service provides quarterly worldwide and regional market size, vendor market share, forecasts through 2022, analysis and trends for (1) data center Ethernet switches by category [purpose-built, bare metal, blade, and general purpose], port speed [1/10/25/40/50/100/200/400GE] and market segment [enterprise, telco and cloud service provider], (2) application delivery controllers by category [hardware-based appliance, virtual appliance], and (3) software-defined WAN (SD-WAN) [appliances and control and management software], (4) FC SAN switches by type [chassis, fixed], and (5) FC SAN HBAs. Vendors tracked include A10, ALE, Arista, Array Networks, Aryaka, Barracuda, Broadcom, Cavium, Cisco, Citrix, CloudGenix, Dell, F5, FatPipe, HPE, Huawei, InfoVista, Juniper, KEMP, Radware, Riverbed, Silver Peak, Talari, TELoIP, VMware, ZTE and others. Cliff will chair the OCP Market Impact Assessment session at OCP Summit in San Jose, CA and be at the Open Networking Driving Cloud Innovation panel session at ONS in Los Angeles, CA. A March 1st press release noted that Technology Marketing Corp (TMC) has selected Aryaka for the 2018 SD-WAN Leadership Award, recognizing the company for its industry-leading SD-WAN technology. Aryaka’s global SD-WAN solution was honored for its technology leadership, market-driven innovation, growth, and outstanding business execution. Deployed by 800 global enterprises, Aryaka is the leading global SD-WAN provider and has the fastest growing SD-WAN solution in the market today, delivering enhanced performance for cloud and on-premises applications worldwide. Aryaka’s global SD-WAN has quickly become the only viable MPLS replacement solution for global enterprises requiring alternatives to legacy WAN infrastructures for mission-critical application delivery. Software-defined WAN revenue accounts for more than 15% of Windstream Communications’ sales, a little more than a year after the company first offered SD-WAN, CEO Tony Thomas said. The regional carrier is getting 30% to 40% of its business segment sales from SD-WAN, unified communications-as-a-service and on-net services.